A few months ago, before the election result which none of us expected but really should have, I wrote a post about how Donald Trump inspired me as a CSPE and History teacher - not because I admire him, but because the incendiary and offensive comments he was making about whole swathes of people should inspire every teacher of history and civics to speak out. Then he became President of the United States. Reading back over that post now I'm struck by how self-assured I was as I derided him. Like so many others, I thought there was no way this man could actually succeed, so I could afford to be ironic and dismissive about him. Like so many others, I was wrong, and I still feel silly about that self-assurance. Now, just over a week into his presidency, his words and actions only reaffirm to me that yes, we do have a responsibility to speak out. No dismissiveness, no jokes. Just a responsibility. 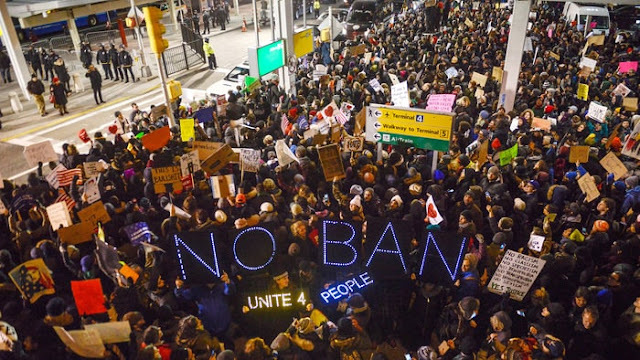 Could you stand in front of a class full of young people and justify Donald Trump's ban on people entering the United States because of their nationality? As CSPE teachers we explain to young people the Universal Declaration of Human Rights and the UN Convention on the Rights of the Child. I'd like to share a few articles from them. The UNCRC, of course, has been ratified in every country of the world except the United States. I ended my previous post by saying that Trump had given us a lot of work to do. Let's get to it.